RGPV Results for final year semesters have been declared and for remaining semesters results has been also published on 31st January 2019. RGPV has successfully conducted the odd semester results for all UG and PG programs in the month of the December for the session 2018-19. Examinees who are waiting for the result will get the same by the end of January 2019. Once the result will be announced, students can check the same from the official portal of the university by using the roll number and other required details. Here, in this post, students will find all the vital information related to RGPV results. It will include information such as result dates, download procedure, details mentioned on result sheet etc. Quick Update 11/3/2019: RGPV has Declared result of CBCS BE / BPharm 1 to 4 , BArch 1st ,2nd Semester and Grade Improvement Result of BE / BPharm (Grading Only) for DEC-18 Examination. Check it from below link. 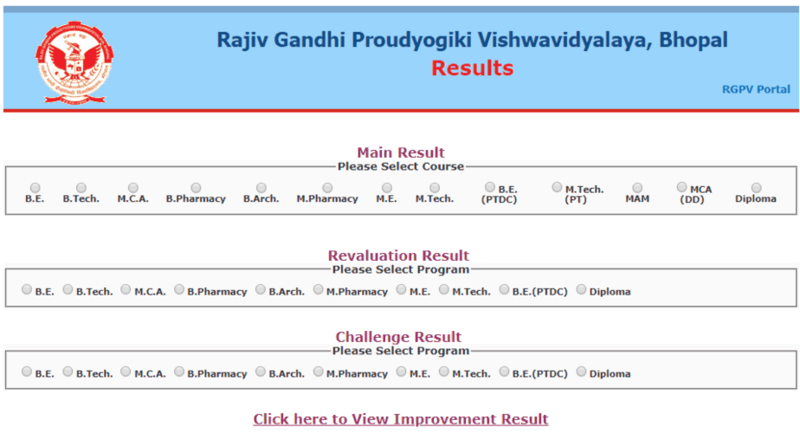 Rajiv Gandhi Proudyogiki Vishwavidyalaya (RGPV) is a public university established by the Government of Madhya Pradesh. Established in 1958, it is a common institute for all the technical institutes which mainly include engineering and pharmacy colleges of the state. RGPV has 200 engineering institutes, 98 pharmacy, 4 architecture, 95 MCA, 5 teaching institutes, and 86 diploma institutions affiliated with it. All the programs in the university are carried out through a semester system. The academic session is divided into two semesters. viz odd semester (1st, 3rd, 5th) and Even Semester (2nd, 4th, 6th). Odd semester exams are conducted in December and even semester exams in May every year. First step is to visit the official website of the university. Here is the official RGPV website www.rgpv.ac.in. In this stage, students are required to select the “Result” link on the homepage of the official portal. Now, a dialog box will appear as shown below and students have to select the relevant course mentioned under the head Main result. Now candidates have to enter the Enrollment No., semester, select grading, enter the code and click on view result. Result will be displayed in the screen. Now, students can check the result. Once students check the result, they can save and take a printout of it for further use in future. However, students are advised not to treat it as the original statement of marks or simply marks. University result sheet mainly indicates the result status of the examinees. Along with the result, some other information is also mentioned on the result. This information includes details such as name of the student, roll number, college, enrollment no., exam date, category, hall ticket no., seat no., course, year, semester, branch, subject, subject-wise marks, grades, total marks, marks percentage, result etc. RGPV result for semesters exams of all the UG/PG programs is available on the official portal. Result for remaining off semesters has been published on January 31st 2019. Examinees have to check the result only through the online mode. They can either visit the official website or can check the result from the direct link provided in this page. University will also notify students about the revaluation of answer sheets after the declaration of result. Interested candidates have to apply within the time specified by the university. Re-valuation result will be declared later. Along with the revaluation, university students are also given a chance to appear in improvement exam once the main result is released. Improvement result will be published later. For query and help regarding RGPV, university students are advised to contact the university at the address shared below. sir diploma ka reval result kb aayega please sir. sir reval ka result kb lagega. sir reval ka result kb aayega please batao n.